Yoro Valley (養老渓谷, yorokeikoku) is the valley of Yoro River ( 養老川) located in Boso Peninsula. It is chosen as the 100 best nature of soil in Japan. There are many riverside walkways placed along the river, especially the walking course of Awamata falls offers you the great hiking with the river, waterfalls and beautiful trees of mountain. There are many hotels, hot springs, and gift shops. Many tourist visit this valley during the summer or autumn because it has beautiful green or autumn leaves. The are many parking and hiking courses. Then name Yoro was originally means, bending knees. So, it means curved shaped because all the brunch rivers including Yoro River are highly curved all the way. During the Edo period, the Kanji Character changed to current ones. Yoro Valley itself is very long valley, but there are two major hiking courses. One is for Kobundo Ruin which offers you great ruins of canal. Another one is around Awamata Falls. 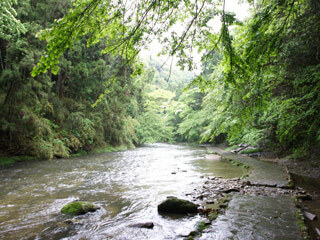 The Awamata Falls riverside walkway is one of the best hiking courses in Boso Peninsula. It offers you the great sound and colors of the river, beautiful trees and waterfalls. There are many water falls run in to the river at Awamata. ...is the ruins of canal which connects Yuki River to Yoro River. It was used be huge hole, but in 1979, the roof was fallen down, and now, it has left the great valley, there. Be aware for flooding when it has heavy rain. There are many evacuation area. Try not to go near the river or waterfalls during or after the heavy rains.